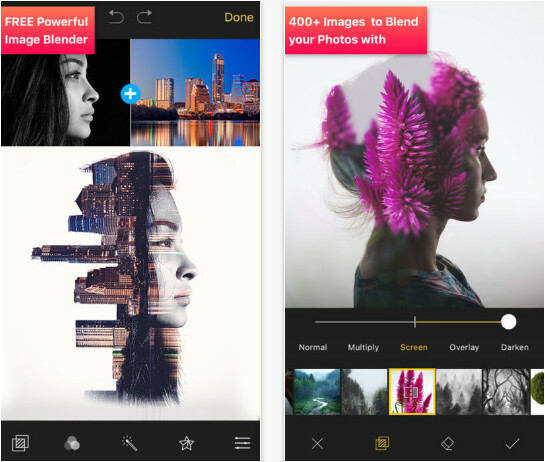 Pic BlendEr app is the superior way to create double exposure and graphic design images in seconds. Get creative and mix photos together to create your own artistic masterpiece in the palm of your hand. Blend your images together seamlessly with a variety of blending options are at your fingertips, such as overlay and multiply to the more unique as difference and exclusion. Access to a library of over 400+ images that will continuously grows with each update. From categories like Landscape and City to Textures or Smoke, we have a variety of images that will fit your style. Discover never seen before filters that will transform your photo into a Classic Camera look or Atrsy RGB look. Add as many filters as you like to a single photo. Choose from over 200+ effects such as Light Leaks, Elements, Swooshes even Fire and Smoke & so many more. You can even select from 12 blend modes to make each effect become truly part of your photo. New & Exciting movable effects. All custom made effects that you can drag and rotate to the perfect position. Tag your photos with #picblender for a chance to get featured!